It’s Open Education Week, and a time to consider and advocate for the resources, tools and practices that employ a framework of open sharing to improve educational access and effectiveness worldwide. The Open SUNY Textbook initiative is a model example of an open educational resource that supports teaching and learning across SUNY. 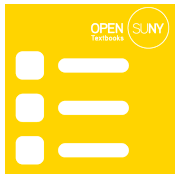 What is Open SUNY Textbooks? Open SUNY Textbooks is an open access textbook publishing initiative established by State University of New York libraries and supported by SUNY Innovative Instruction Technology Grants. This pilot initiative publishes high-quality, cost-effective course resources by engaging faculty as authors and peer-reviewers, and libraries as publishing service and infrastructure. Learn more here.